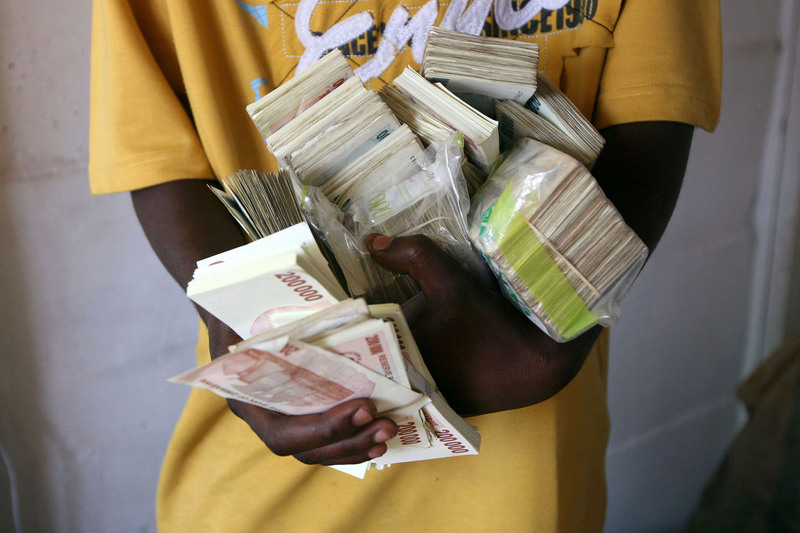 Tens of millions of Zimbabwean dollars will be exchanged for US dollars at an unofficial currency exchange in Harare. Due to economic policies such as capping prices and printing more money, official annual inflation In Zimbabwe is approximately 8,000%. Unofficial rates are double that number. Zimbabwe, a landlocked country in southern Africa, gained independence from white ruled Rhodesia in 1980. Since independence President Robert Mugabe and his Zanu-PF party have ruled the country. Once considered a breadbasket for southern Africa, Zimbabwe has in recent years been plagued by rampant poverty, authoritarianism and over 80% unemployment. Recently, there have been shortages of food including some of the most basic such as bread, flour and cooking oil. There are also large shortages of fuel for cars and other products.